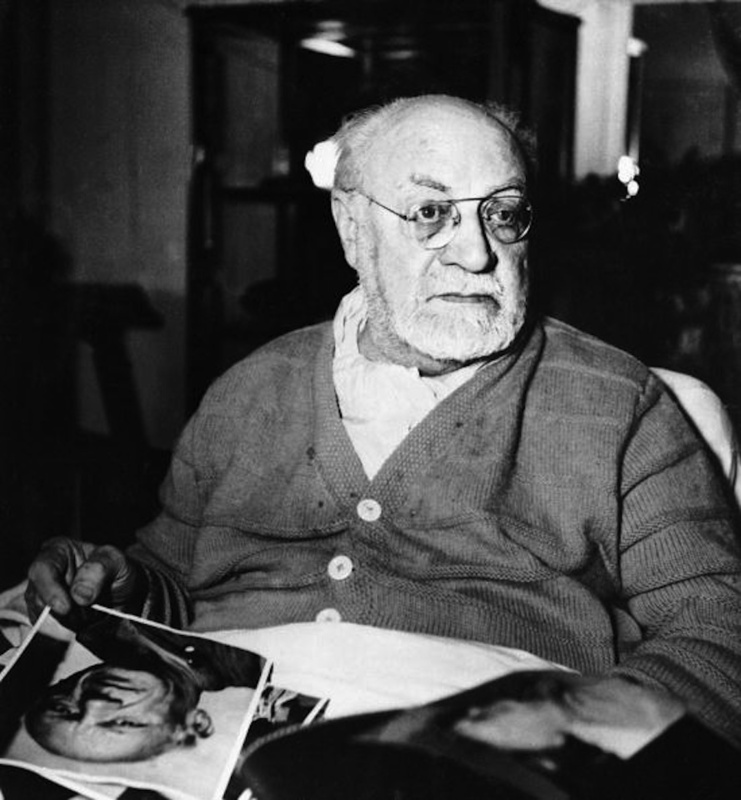 Remarking on the fact that Picasso did not visit often enough, Matisse once said: “ ‘We’ve got to see each other often, because when one of us goes, there are things the other will no longer be able to say to anyone.’ But he never comes.” Picasso did come, and he did so more regularly than Matisse’s words would seem imply. 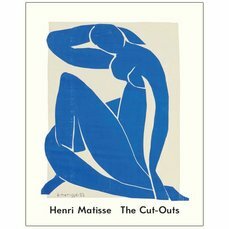 Francoise Gilot, who was Picasso’s partner at the time when Matisse was making the cut-outs, recalled how ‘no one meant quite as much to him (Picasso) as Matisse.’ Both friends and rivals, the two enjoyed each other’s company and especially the many heated conversations they often entertained when Picasso and Gilot visited Matisse at his Villa le Rêve studio in Vence, an inland town on the French Riviera, and at the Hôtel Régina in Cimiez, a hilltop suburb of Nice. 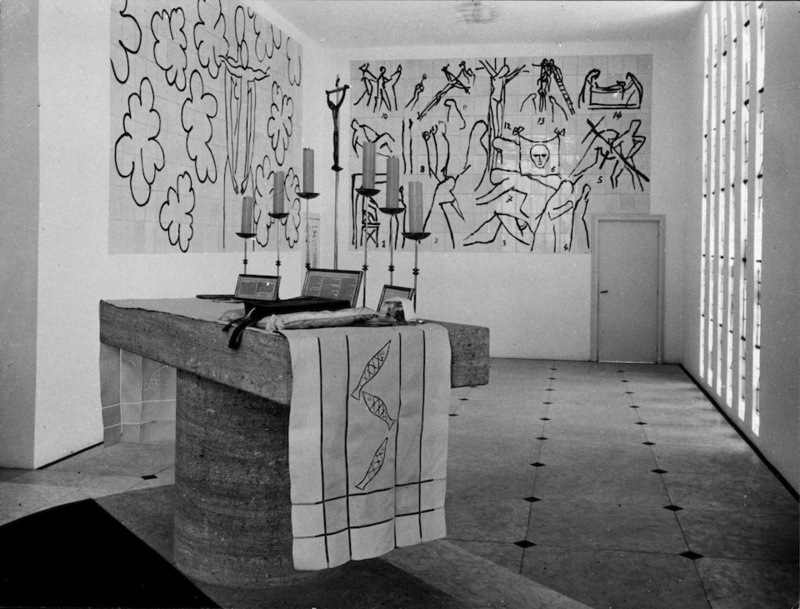 On one such occasion Picasso emphatically criticised Matisse’s choice to decorate the Vence Chapel. And although Picasso once compared Matisse’s designs for the chapel to a bathroom, he was moved by the beauty of the chasuble cut-out designs. 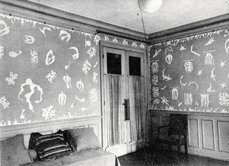 Significantly one of Picasso’s paintings - Vallauris Landscape (1951) – is portrayed amongst Matisse’s chasubles in Hélène Adant’s photograph. Vallauris Landscape was one of many paintings and drawings that Picasso would bring over to show Matisse. One day Matisse said to Pablo, ‘I ought to give these to you because they look like some you’ve already painted.’ By these he meant four pigeons, part of his large aviary collection. Picasso and Gilot accepted the gift and brought the birds back home with them. As Gilot recalls one of the pigeons went on to have a ‘very distinguished artistic and political career.’ A black and white lithograph depicting the pigeon in a dove-like guise was in fact soon chosen for the poster advertising the Communist-sponsored World Peace Congress, becoming the utmost symbol of peace till this day. 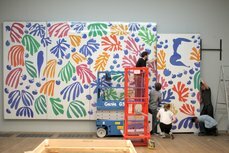 Welcome to our Matisse blog!